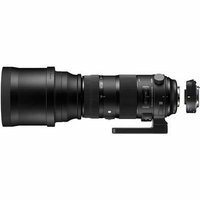 The Sigma 150-600mm f5-6.3 S DG OS HSM Lens is an excellent choice for action, sports and wildlife photographers who demand superior performance as it boasts not only durable and hard-wearing construction but also optical elements of class-leading quality. This version, for Nikon fit, comes with a 1.4x teleconverter for that bit of extra reach to capture distant subjects. Featuring water-resistant coating, an optical stabiliser and a rounded 9-blade diaphragm for pleasing bokeh, the Sigma 150-600mm f5-6.3 S DG OS HSM is a superb all-rounder.